Rinse and drain lentils. Meanwhile prepare pan or BBQ for a medium heat. Season fresh salmon fillets with paprika, lemon, salt and pepper then place on the grill skin side down. Cook for 3 minutes,then turn and cook for another 3 minutes or until cooked to your liking. In a bowl create a dressing by combining white wine vinegar, Dijon mustard and extra virgin olive oil. Drizzle the lentils with the dressing, add capers and raisins. 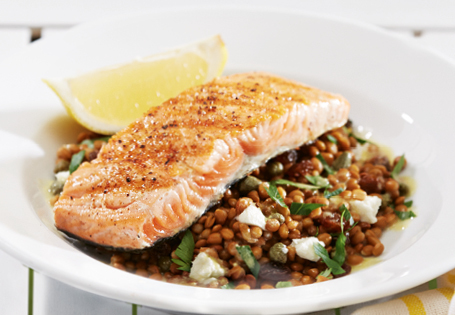 Serve salmon on top of lentils with goat's cheese and chopped parsley for an extra special meal.